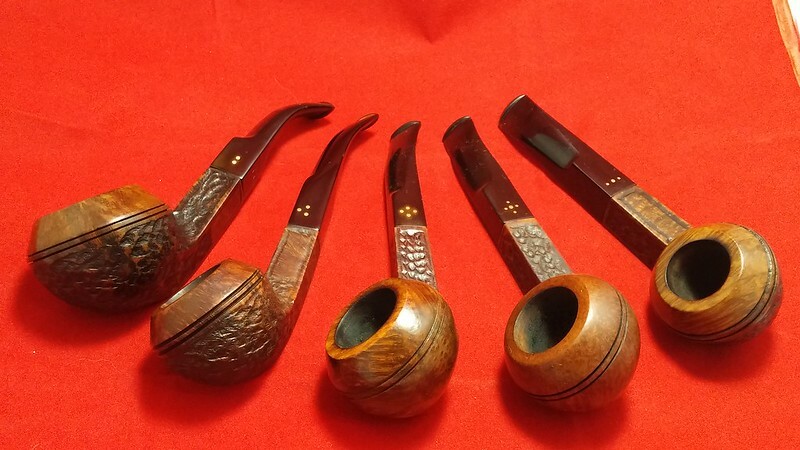 I’ve collected a few Brigham Shape 26 Bent Bulldog pipes over the years. 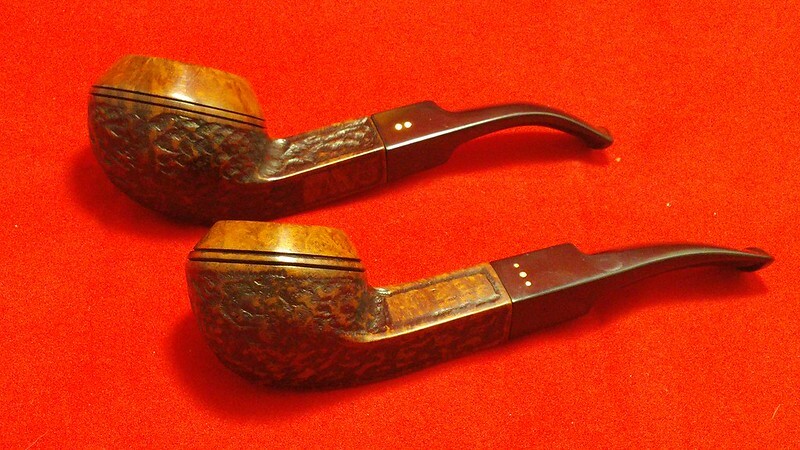 The shape is one of my favourites, and was produced at every level in the Brigham range except the entry-grade 100 series. I had examples of the shape in 3-, 4-, and 5-Dot versions, so when I had the opportunity to acquire both a 2-Dot and a 6-Dot Bent Bulldog from a fellow collector, I jumped at the chance to complete my 5-day set. The 6-Dot is a Patent Era Brigham, stamped “626” and “Brigham” over “Can Pat 372982”. The stem is pinned with the vertical 3-dot Small, Big, Small pattern. According to Pipephil.eu, the aligned 3-dot pins (in both vertical and horizontal orientations) were used to represent the 600 series pipes in addition to the more widely recognized six pin “star” pattern. The 2-Dot is a little newer, and is stamped “226” and then “Brigham” over “Made in Canada”. The stem carries the two brass pins of the 200 series pipes. 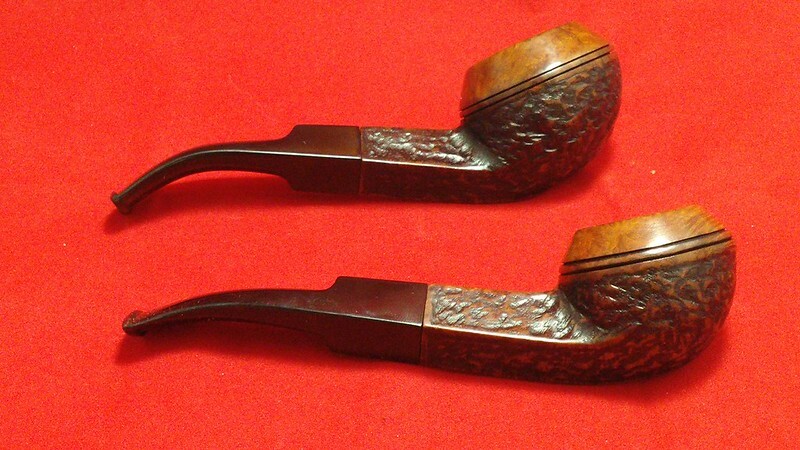 This pipe was produced somewhere between 1956 and 1970 or so when Brigham started stamping their stummels with the shape number and simply “Brigham” over “Canada”. I took these pictures of the pair soon after they arrived in the mail. 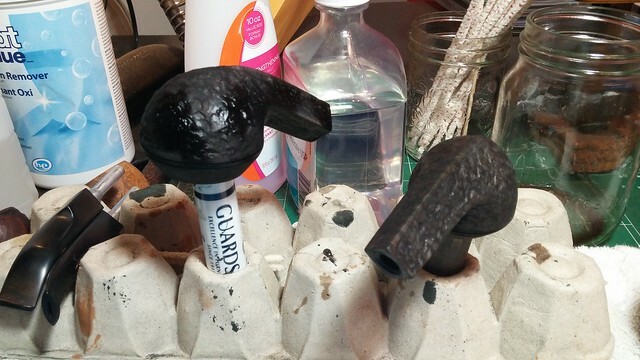 Coming from another collection, the pipes were already clean and in good repair. 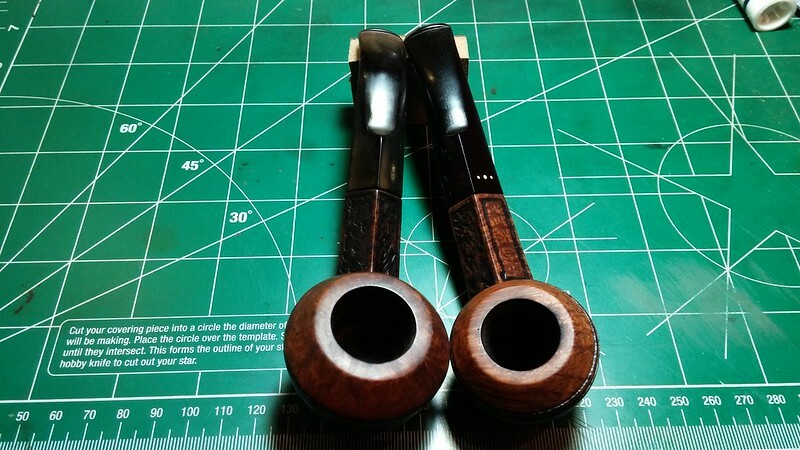 Neither had any damage, and other than a bit of stem oxidation, the pipes would clean up quickly. Two things jumped out at me on first inspection. 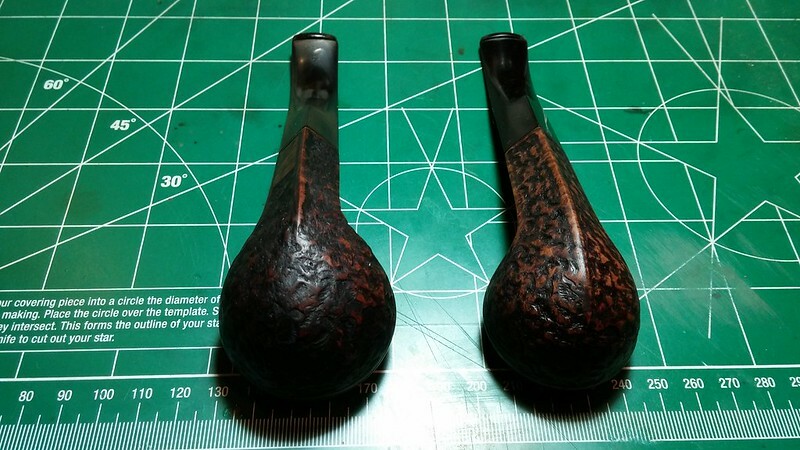 There is a significant size difference between the pipes, with the 229 bowl being the larger of the two. I compared it to my other bulldogs and realized that for whatever reason, this 2-dot pipe is the odd man out. 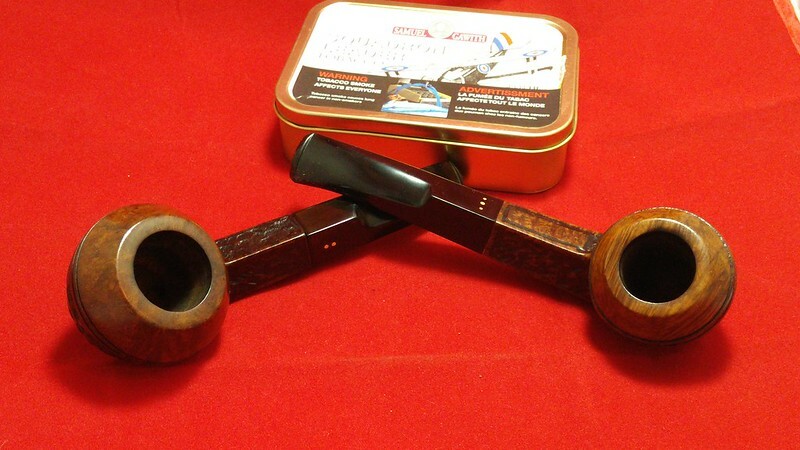 It has the same bowl diameter as the Stanwell Danish Sovereign Rhodesian I restored recently, while the “regular” Brigham bulldog pipes are noticeably smaller (what Brigham would have called a Medium size back in the day.) 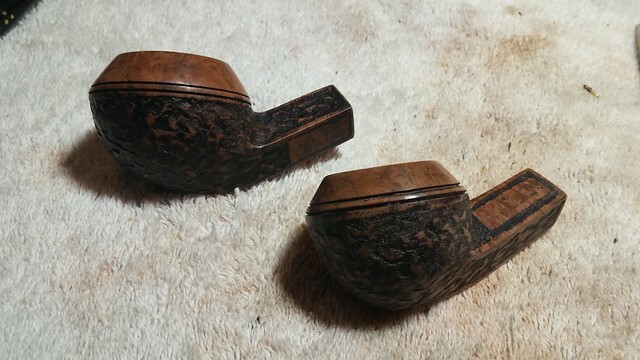 I know that sometimes Brigham offered pipe shapes in multiple sizes, so I looked over the stummel carefully for any evidence of a size stamp (S, M, L, or XL), but to no avail. The size difference remains a mystery, but I rather like the larger girth. It fits well in the hand, though the pipe is heavier than the rest of my 29’s. 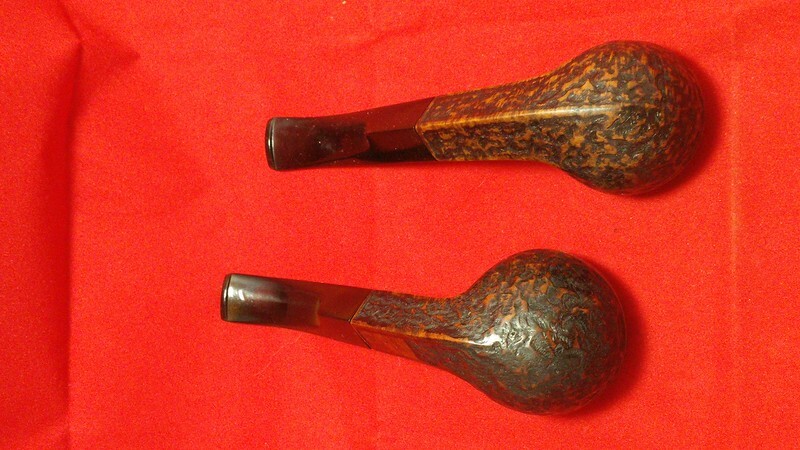 The other oddity about this pair of pipes was the colouring. The finish on the pair was in too good condition to be original, but it looked a little off somehow. The colour of the rustication was too solidly black and the smooth briar looked almost natural instead of the expected brownish stain. After spending some time staring at them, I concluded that the old finish had been removed and the deep rustication had been coloured in with either a black stain pen or Sharpie marker. 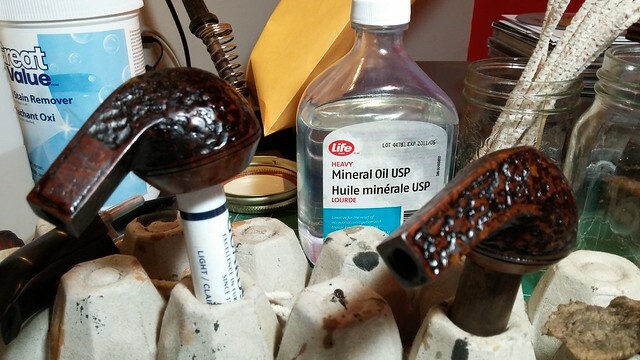 This is a fairly common DIY method for darkening rusticated areas – I’ve used the Sharpie myself more than once – but I wanted to soften the effect and restain the briar to more closely match the factory original look. There were also a few spots on the smooth areas of the pipes where the stain pen had slipped a bit, leaving dark spots on the twin rings. I’d clean those up while I was at it. 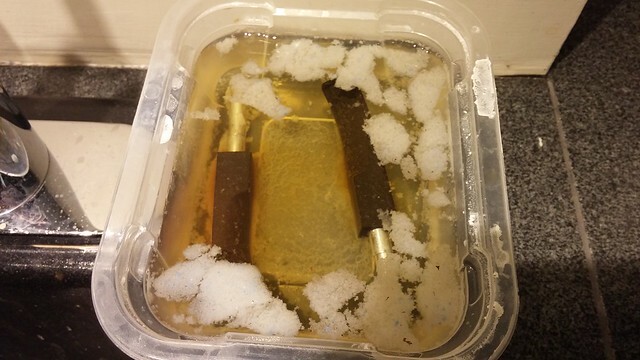 As the pipes were already more or less clean when received, I started off by dropping the stummels into an alcohol bath to try to soften the black stain a bit, and popped the stems into an Oxyclean bath to lift the oxidation from the Vulcanite. I left the parts to soak overnight, then pulled the stummels from the alcohol and scrubbed them vigorously with an old terry towel to remove as much of the old stain as I could. I followed this with a wipe-down with acetone and cotton pads, which removed even more of the black. The marker was coming off, but ever so slowly. 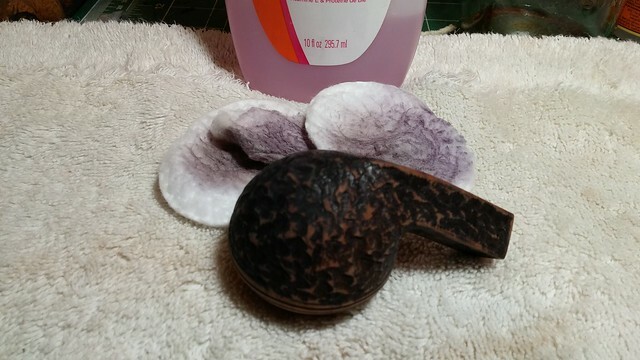 One last push with Murphy’s Oil Soap and an old toothbrush saw more colour coming off the briar (and made nice purple suds!). I finished off the process by scrubbing the rusticated areas with 0000 steel wool to strip the high points back to bare wood. I used a scrap of 220-grit sandpaper to gently tidy up the spots of over-shot marker on the smooth areas of the bowls. I followed this with medium and fine sanding sponges and a 1500-grit micromesh pad and then set about re-staining the pipes in order to recreate the factory Royal finish. 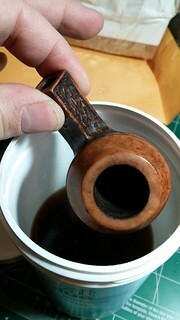 I began by applying a solid coat of Fiebing’s Black water-based leather dye to the entire stummel. 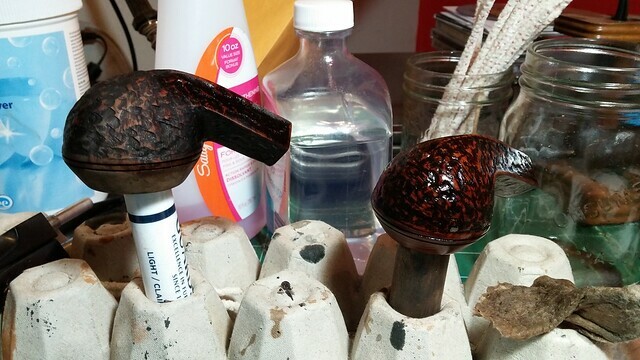 After the dye dried, I gently wiped most of the black off with steel wool and a bit of water, leaving the wood grain and the deeper parts of the rusticated areas stained black. The top colour coat was a blend of Fiebing’s Saddle Tan and Dark Brown leather dyes mixed and diluted to product a deep red-brown colour wash. This was again applied over the entire stummel until I reached the depth of colour I was looking for. 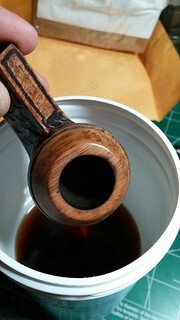 I let the dye dry and then rubbed the stummels in an old towel to remove any excess before wiping the briar with a bit of mineral oil to rehydrate and give the finish depth and pop. 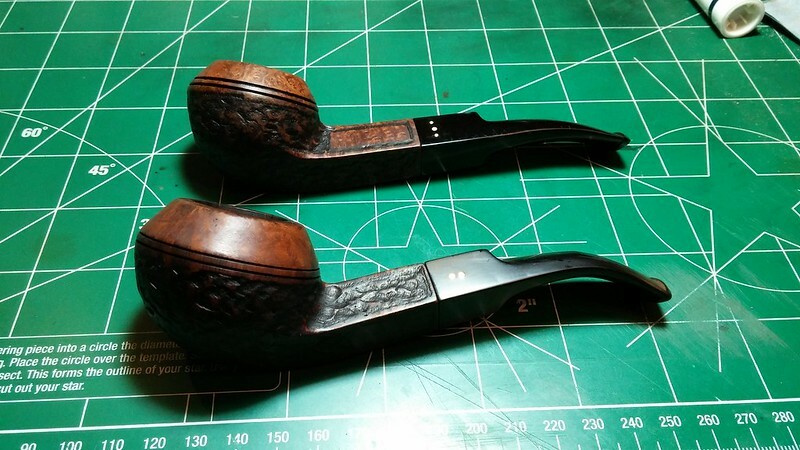 I let the stummels rest while I worked on cleaning up the stems. There was really very little work to do here – so little in fact that I forgot to take pictures along the way. 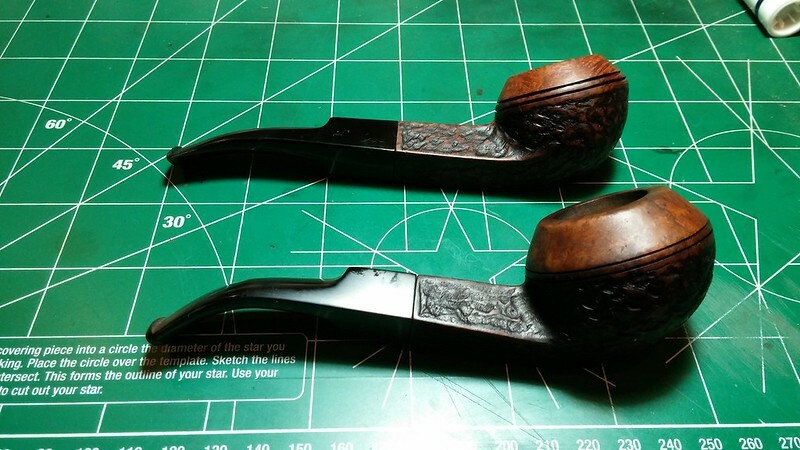 After the Oxyclean soak, I scrubbed the oxidation from the stem surfaces with 0000 steel wool and Magic Eraser before smoothing and polishing the Vulcanite with 600 – 2000 grit wet sandpaper. I dried the stems inside and out, and then wiped them down with mineral oil. The finished pipes now went to the buffer for a run of White Diamond compound and a few light coats of Carnauba wax to shine and protect. They look great, and are ready to take their places in the rack next to their brother briars. Here are the finished bulldogs. The last pic shows them with the complete five-day set. Guess I’ll have to build a custom rack! Thanks for looking and until next time, Happy Piping! Great job on the stems and nice additions to your collection. Whoever parted with those bulldogs is crazy. I’m glad you enjoy them and remember…..I have plenty more. Cheers. I love a shape collection in various finishes. Nice job on the stain updating. They had a DIY look to them, but now look factory, nice! Cheers, Al. My goal was to make sure all the pipes looked related if not exactly alike. Coming from different production eras and product lines. ther is going to be variation but they should all look like part of the larger family. Charles, great article and fantastic job done on the pipes. They now have a soft and warmer glow to them.